Egypt shares are seen by analysts edging closer to a bear market territory as sell-off pressures continue amid a wider sell-off streak, in every emerging market around the globe. Last week, the MSCI emerging market index fell 4.8%, recording its worst weekly loss in 2018. “The 4.8% drop in the MSCI index last week, suggests that investors are starting to factor in the prospect of the US economy slowing in response to tighter monetary policy. We think that this will start to happen in 2019, causing equities in the US and elsewhere to fall much further, as well as forcing the Fed to stop hiking rates, and pushing Treasury yields down,” said Capital Economics in a recent research note. The report indicated that something similar happened a couple of times towards the end of the last economic cycle too. “We think that a slowdown in emerging markets is no more than a few quarters away. While we are not anticipating anything as dramatic as the global financial crisis, we do think that economic growth will clearly have fallen significantly by mid-2019,” the report added. The Egyptian Exchange (EGX) saw a negative performance last week, which had only four trading sessions, as Sunday was a national holiday, while Egypt commemorated the 45th anniversary of the Sixth of October War triumph. The benchmark index EGX30 dropped 814 points, or 5.8%, and ended the week at the level of 13,283.3 points. The small and medium-sized enterprise index EGX70 lost 2.4% settling at 685 points, while the broader index EGX100 went down 2.8% to 1,718.94 points. The equal-weighted index EGX50 fell 7% reaching 2,046.5 points. Market capitalization amounted to EGP 744.19bn by the end of the week’s trade, losing EGP 38.48bn. 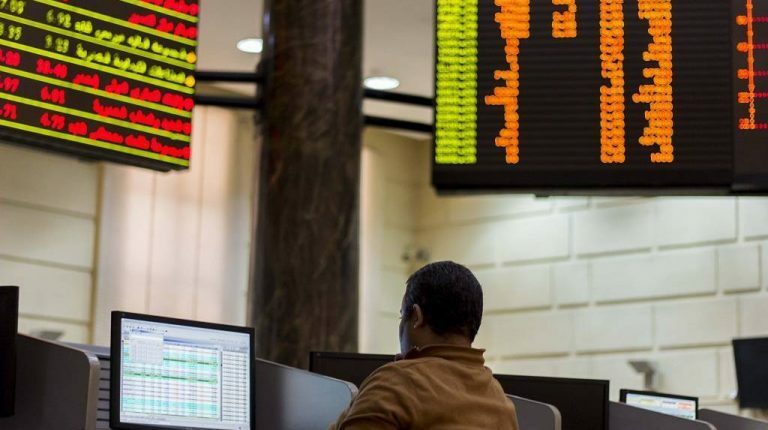 Market expert Said El-Fekky said that the market was affected by a global decline in stock markets around the world, nearing its lowest levels since May. Breaking the support level of 13,600 points triggered more selling pressures on the main index, with rising concerns among investors, he explained, noting that the current support level is at 13,000, while EGX30 will continue to target the return to the 14,000-point level. Thursday’s trading session marked the week’s worst session, with the main benchmark index closing in red territory amid global stock rout, dragged down by foreign sell-offs. The benchmark EGX30 index plummeted 337.92 points, or 2.48%, to 13,283.31 points, the lowest level since September 2017. Foreign investors were net sellers with EGP 1.4bn, while Egyptian and Arab investors were net buyers with EGP 967.9m and EGP 524.4m, respectively. The small- and mid-cap EGX70 index shed 1.12% to 685.07 points, while the broader EGX100 index slipped 1.3% to 1,718.94 points. Likewise, the equal-weighted EGX50 index fell 2.53% to 2,046 points. Global Telecom Holding (GTH) was among the worst performers last week, as the company said that the Netherlands-based VEON Ltd withdrew its offer to acquire GTH’s assets in Pakistan, and Bangladesh for $2.55m. GTH’s board of directors is considering alternative capital hike initiatives and potential future transactions, according to a filing to the EGX. In September, GTH revealed it might not approve VEON’s acquisition offer. The Dutch company emphasised that it would maintain its offer, however, it is unlikely to be indefinitely available at the time. In July, the telecom company unveiled it received an offer from VEON Ltd to purchase its assets in Jazz, and associated operations for $2.55bn. Meanwhile, banks stocks remained stable last week, as Moody’s Investors Service changed the outlook for the Egyptian banking system to positive from stable. The ratings agency said in a report that its decision is attributed to the economic growth picking up, thus supporting credit growth, banks’ profitability, and internal capital generation, especially with the strong links between the banks’, and the government of Egypt’s (B3 positive) improving credit profile. This is due to the large exposure that Egypt’s banks have to the country’s government through investments in securities and loans, which stood at 40% of total banking system assets as of June 2018. “Increased domestic private sector investment, large infrastructure projects, as well as higher exports will drive economic growth and credit demand”, the report indicated. The key drivers of Moody’s positive outlook for the Egyptian banking system are the improving operating environment, following the implementation of structural reforms which put the country on a path of sustainable, and inclusive growth. Meanwhile, Sarwa Capital’s IPO has been oversubscribed 30.1 times, EGX announced last week. Total purchasing orders on the private offering reached 887.4m shares, the Egyptian bourse highlighted in a statement. Sarwa Capital previously said that the private offering was oversubscribed 10.83 times, with 265.65m shares offered at a value of EGP 1.96bn. The final price of the IPO was set at EGP 7.36 per share, while trading on the stock will begin as of Monday, 15 October, under the symbol of SRWA.CA, following obtaining the approval of the EGX. In other market news, Qatar National Bank Al Ahli (QNB Al Ahli) reported a 26.8% year-over-year (y-o-y) increase in consolidated profits for the first nine months of 2018, recording EGP 5.38bn from EGP 4.24bn. Net income grew to EGP 9.35bn in the nine-month period ended September, versus EGP 7.71bn in the same period of 2017, the bank highlighted in a filing to the EGX. Meanwhile, standalone profits rose to EGP 5.16bn at the end of September, versus EGP 4.06bn in the year-ago period. QNB Al Ahli previously reported a 27% y-o-y increase in consolidated profits for the first half (H1) of 2018, generating EGP 3.4bn from EGP 2.7bn. Net income grew to EGP 4.9bn in H1-18, versus EGP 4bn in the six-month period of 2017. On a quarterly basis, the bank generated EGP 1.8bn in profits during the second quarter (Q2) of this year, compared to EGP 1.4bn in Q2-2017.